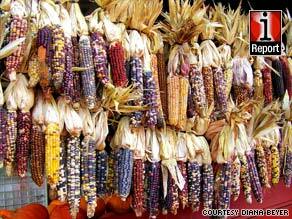 There are signs that autumn has arrived, from state fairs to birds migrating south, iReporters say. (CNN) -- This week in iReport, we've received visually beautiful photos and a culturally beautiful story. See iReporters' gourmet home cooking, and take a look at the images that signal autumn's arrival. And be sure to take in the story of a small barbershop where customers can find common ground on controversial political issues. Check out the video here , or get a better idea of the stories below. •Gourmet at home: When publisher Condé Nast announced it was shutting down Gourmet magazine, culinary enthusiasts on iReport.com celebrated the magazine by sharing tales of Gourmet-inspired meals they'd made at home. The photos are mouth-watering to say the least. iReporter Tanisa Samuel said she'll be awfully sad to see the magazine go. She says it changed her life: "I went from being a basic chicken and rice cook to hosting elaborate gourmet dinners!" •Barbershop politics: Jack Quavis owns Taylor Mae'd Barber Shop, an old-fashioned place with one distinguishing feature -- customers can share their thoughts on camera about current events while getting their hair trimmed. Politics are the topic of choice in this one-room Buffalo, New York, barbershop, and Quavis says that men are eager to share their opinions once they step inside. Quavis thinks Washington could learn a lot from his barbershop, where he says "somehow or another ... we manage to find common ground." •The subtle signs of fall: Colorful foliage, cheerful pumpkins and Halloween decor are all sure signs that autumn has arrived. But some of our iReporters had a more unusual view of how they know the season has turned, and they shared their photos. See empty beaches, state fairs, birds flying south for the winter, and the Alaskan tundra fading to a brownish-gray. You can even take a look at Australia, where lambs are a sure sign of spring -- meaning, of course, that it's fall here in the northern hemisphere.